When it comes to being patriotic the United States never fails to set the bar, however, since the mid-late 1900’s production has become mainly outsourced to other countries in hopes of saving a quick buck. Due to the large factories that oftentimes cut corners to produce more products at a faster rate, quality is never something we can be too certain about. Luckily, thanks to Goodyear tire and their state of the art Endurance trailer tire made in the good old USA, we can now relax and know our trailers will have the support they need to keep us on the road. The Goodyear Endurance is the new and improved trailer tire everyone is talking about. Being made here in the United States, Quality and overall dependability is redefined with the durability and internal structure of the Endurance. Regardless of what type of trailer you may be hauling from a boat to construction, this tire will reinstate a sense of confidence while on the road. With load ranges available from D and E, even the largest load capacity trailers have an opportunity to experience the quality Goodyear has to offer. 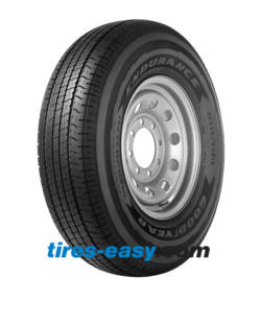 Not to mention, the Endurance trailer tire has a speed rating of N which is compatible at highway speeds for all of you spirited drivers who find yourselves pulling the boat to the lake for the weekend. Well besides being a direct reflection of the USA (Powerful and Revolutionary), the Goodyear Endurance also has been developed in a unique size that allows for a taller/wider profile. Introducing the ST255/85R16 to the trailer tire world which now permits the overall height reflected by the trailer along with a stronger road-to-tire connection based upon the increased width. The height of this tire also allows for those with a lifted truck to reduce the drop distance between the hitch and trailer.